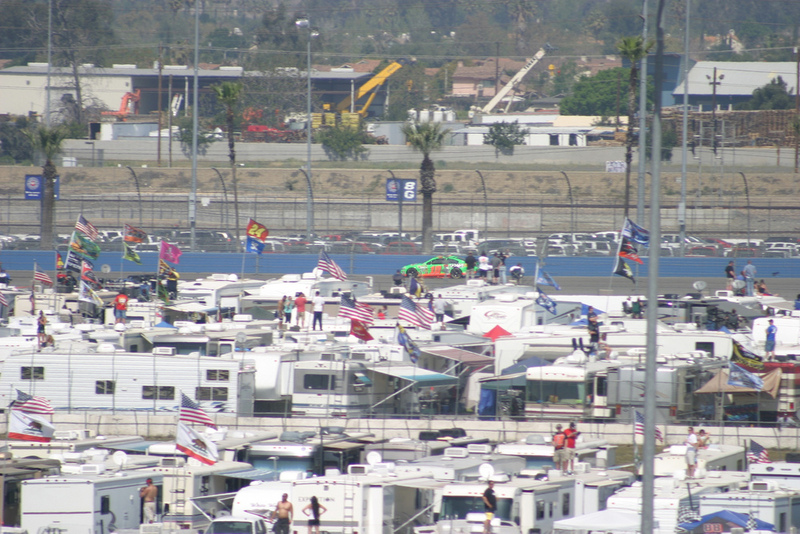 Our First NASCAR Race- Auto Club 400 — Always Packed for Adventure! It's the destination and the journey. Dan and I have spent our relationship without cable. This isn't normally a big deal for us, as we can get most of what we want through iTunes, Hulu and Netflix. The only major problem that we have come across is getting our NASCAR fix. We've tried watching races at various bars, all a very distracting experience. Just finding the race at a bar is a challenge, because Los Angeles is not much of a NASCAR town. 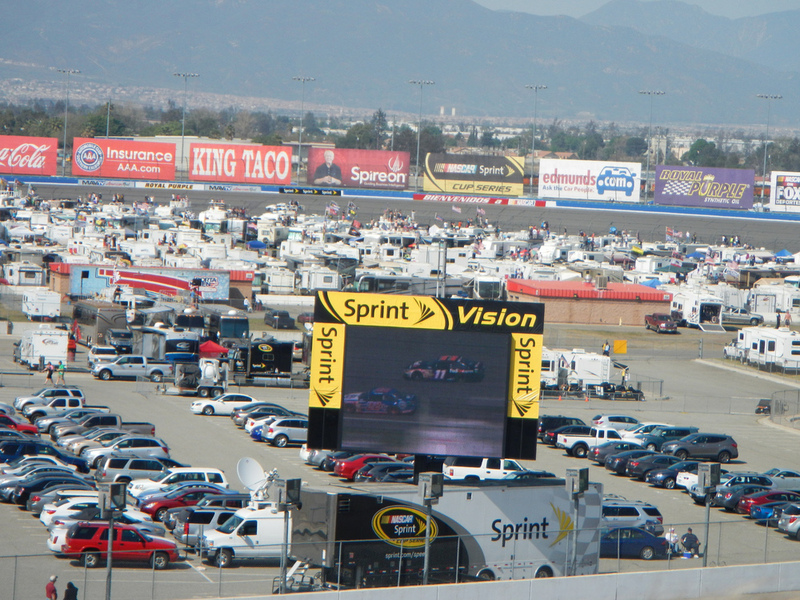 On Sunday, March 24th, we drove out to the Auto Club Speedway in Fontana for the Auto Club 400. 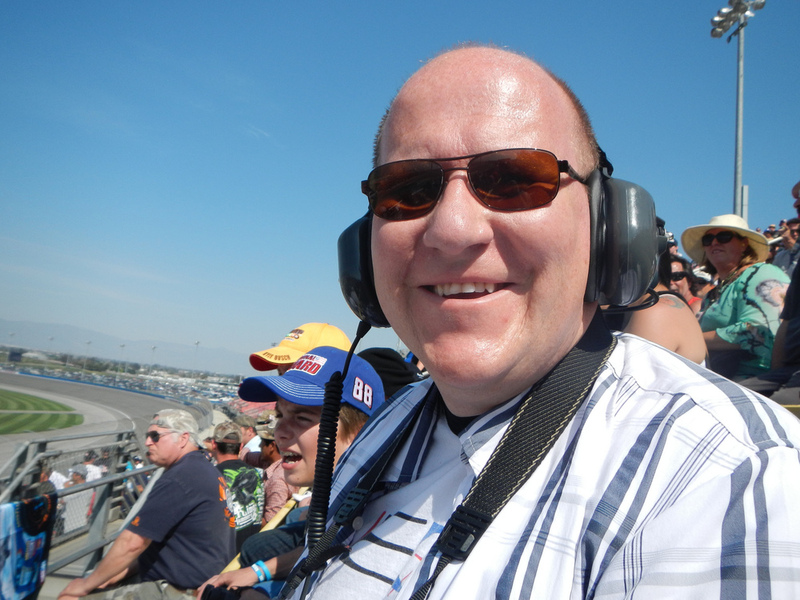 This was our first experience attending a NASCAR race and we tried our best to prepare for the day. We read up on recommendations regarding what to wear and bring, which caused us to spend a good chunk of Saturday running around town attempting to acquire items. 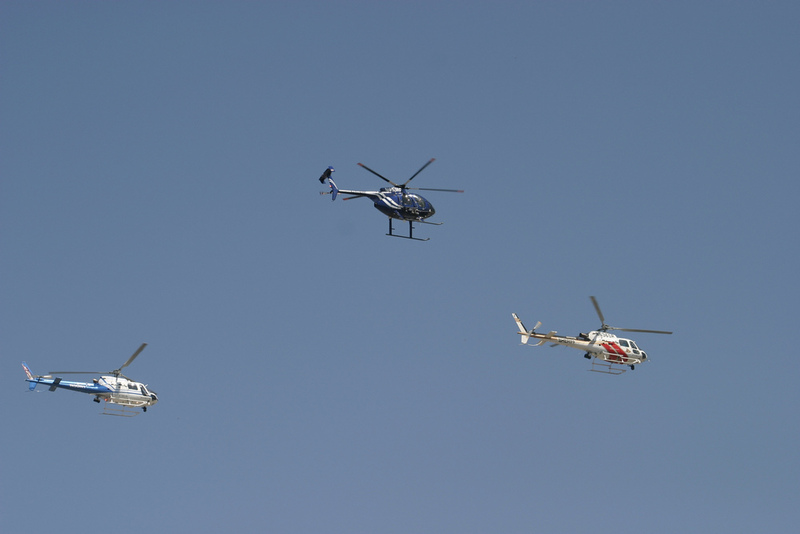 Now having experience, here are some tips that I can impart to fellow NASCAR newbies. 1. Unless you already own a seat cushion, don't bother buying one in advance. We went to several stores around Los Angeles and couldn't find anything appropriate. It turns out, they sell them for ten dollars at the race. We thought that is was good deal and it gave us a cheap souvenir. 2. We read that we should pack a lunch and assuming that the prices were going to be outrageous like at other sporting events, we heeded the advice. 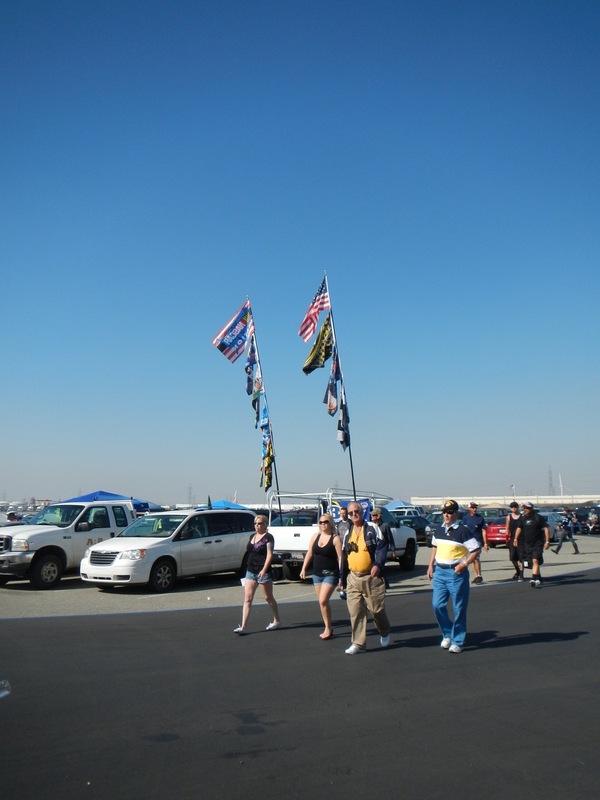 The Auto Club Speedway has tight regulations on the size of the soft sided cooler that you are allowed to bring. They allow a 6x6x12 cooler, which isn't very big! We didn't have this and spent twelve dollars for one at Target. In the end, I wish that we had skipped bringing food. It was a hassle and it was so sweltering hot, that some of the food spoiled before we could eat it. 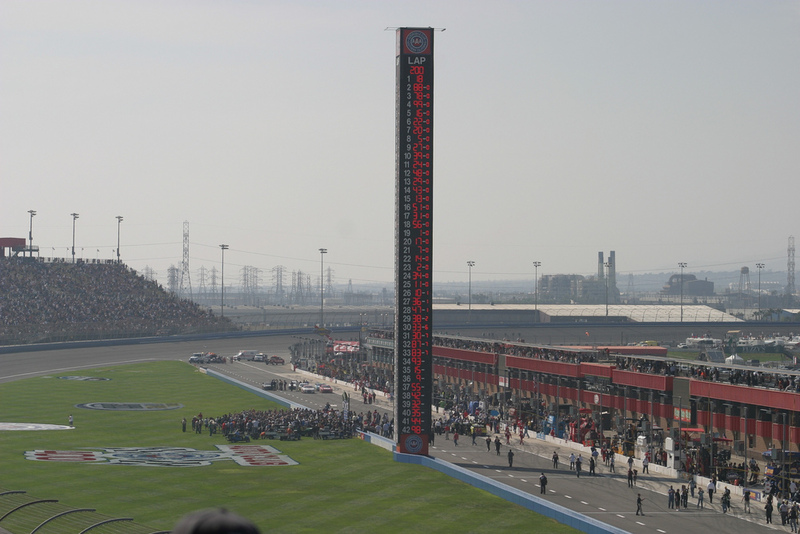 It turns out that the food (and beer) are fairly reasonably priced at the Auto Club Speedway. Twenty bucks would have kept us full, happy and not lugging around a personal cooler! 3. Don't buy alcohol, even if the price is reasonable. I suffered greatly from drinking a beer while sitting in the hot sun. I spent 1/4 of the race underneath the grandstands in the shade, because I felt so sick. 4. Bring bottled water and keep hydrated. 5. If you plan to buy food there, buy it early. Several stands sold out of items. This included water and drinks. 6. Apply and reapply sunscreen. I came home with a prickly sunburn. 7. Bring ear protection. It's much louder than you think it will be. 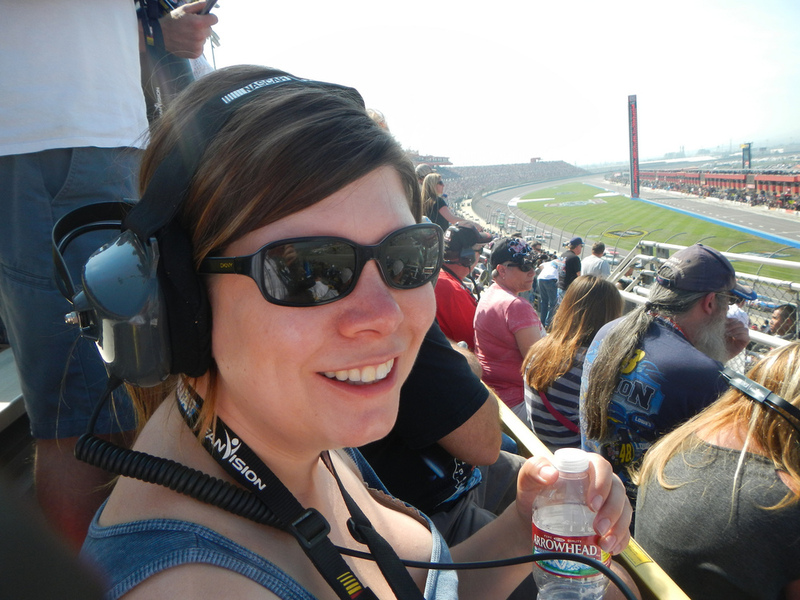 I felt like getting ear protection was more important than the water or sunscreen. Surprisingly, lots of people don't bother protecting their ears or their children's ears. It was awful seeing young children without the proper protection. 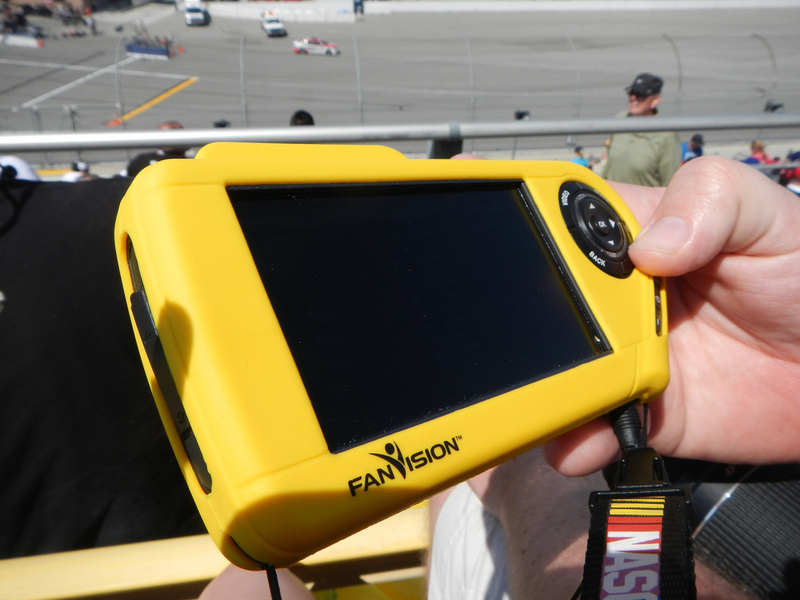 We rented Fan Vision, which came with two sets of headphones in which we could hear race and driver commentary. It was entertainment and protection together. The price was around seventy-five, but it was well worth it. It's much more engaging to be able to hear the race commentary. The Fan Vision came with a monitor, where we could watch videos and keep track of stats. The parking lot opened at five am, but we decided to sleep in and get there around ten. There was a massive queue to the free, dirt parking lot, but the attendants were super efficient and we didn't wait long. 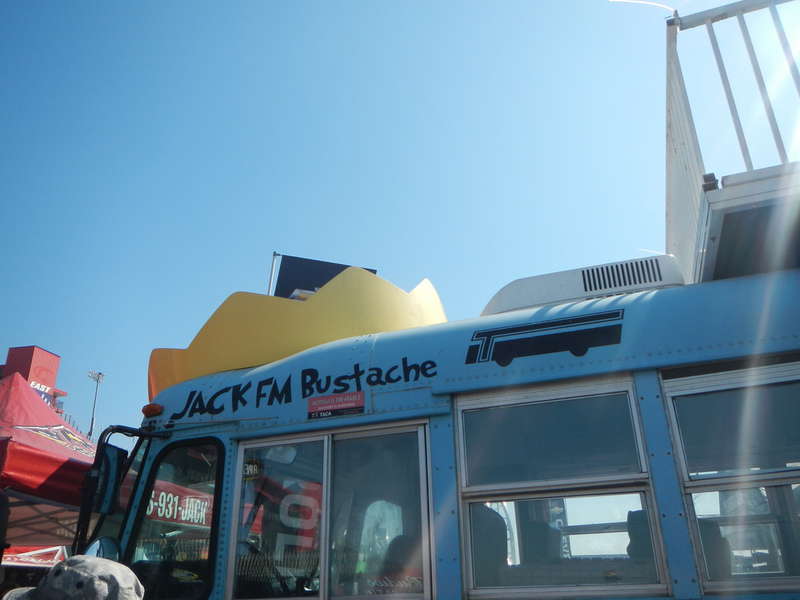 There were many people having tailgate parties in the lot, some were very elaborate set-ups. It gave me the urge to buy a kiddie pool and fill it with beer! 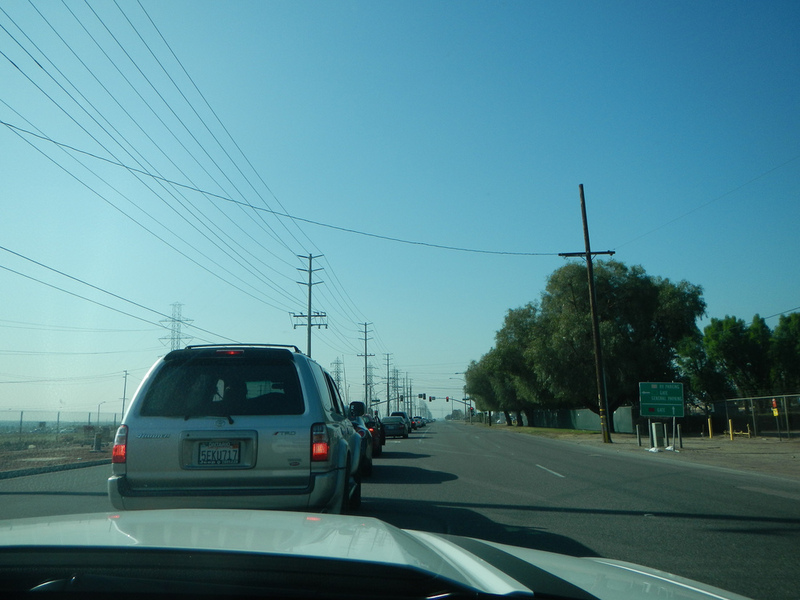 The long line to the parking lot. Finally parked. The dirt got stuck to our sun-screened bodies and we were filthy! Flags in the parking lot. Lots of flags and tailgate parties! Next time, we would probably opt to pay for the close parking in the paved lot. The walk from the dirt lot took about twenty minutes and was probably about a mile. They had a shuttle bus making runs, but we opted to hoof it. Once we got inside the of the gates, there was a lot to see and do. We decided to check out our seats first. This being our first NASCAR event, we relied heavily on internet advice to pick seats. We ended up in the middle of the grandstands, close to the end of the pit lane. A good location that we would likely pick again. Dan in front of our section. Note the small bag that he is carrying, that was our lunch bag. The view from our seats. We regretted not spending the extra thirty-five a ticket for pit passes. It would have been cool to get a close-up look at the pits and cars, but that's something that we can look forward to the next time. We headed out of the stadium to the massive field on the property to see the exhibits, concessions and merchandise. Jimmie Johnson's Merch. I was rooting for the cute local boy! Dan with his other girlfriend. The Danica Patrick merch booth was by far the most crowded. 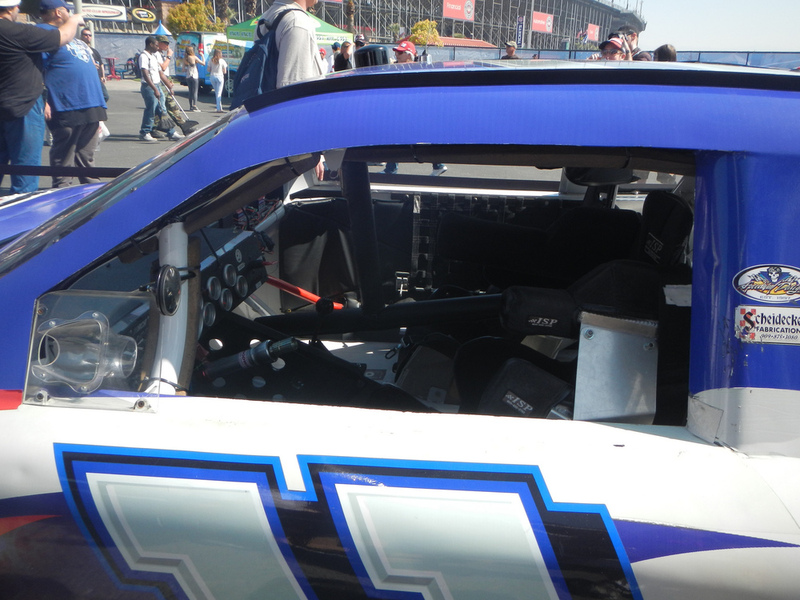 We got to our seats about twenty minutes before the race was set to start. It's amazing how quickly the grandstands go from empty to packed. 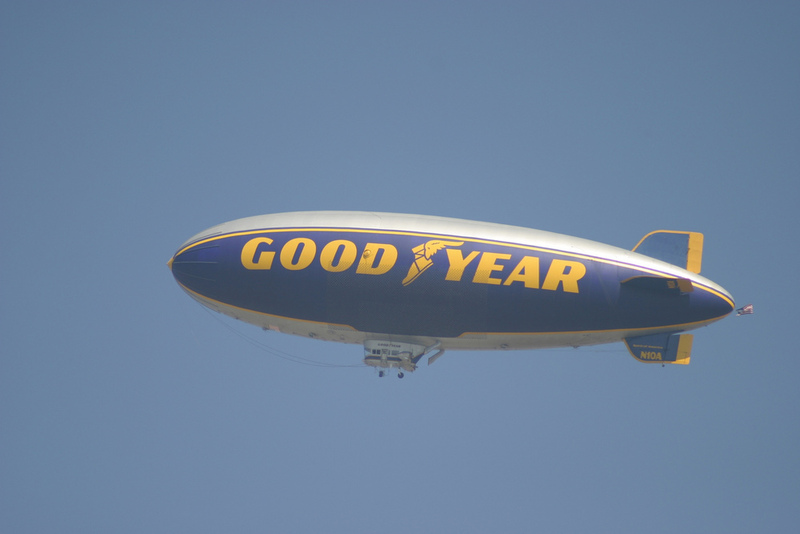 What would a sporting event be without the Goodyear Blimp? The cars are starting to line up. I found watching the pits to be the most interesting aspect of the race. It's amazing how fast the pit crews work. And back in the race. All done in the blink of an eye. 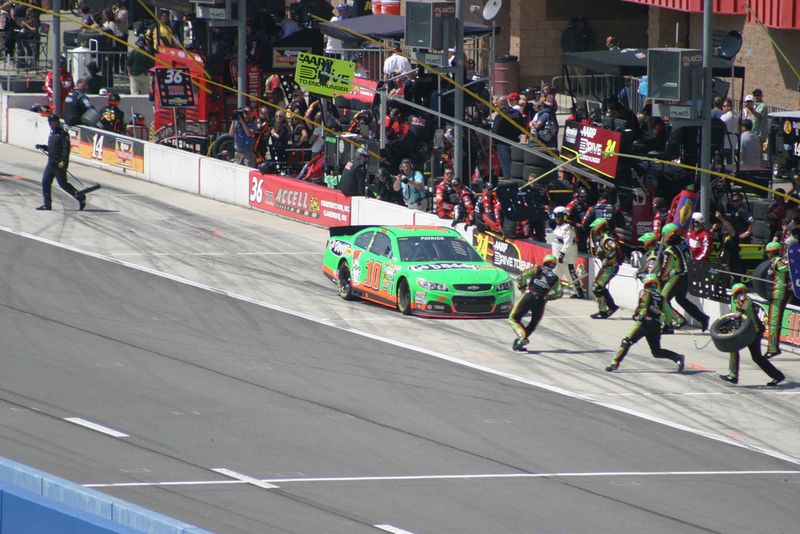 Danica Patrick pulls into the pit. We were told via multiple source to make sure to bring binoculars. We had them on the dining room table and completely forgot them. It was bit of a bummer and sometimes hard to see all of the action, but Dan brought the good camera and managed to take some great shots of the race. Danica on the backside of the track. The big screen was easy to see from our seats. 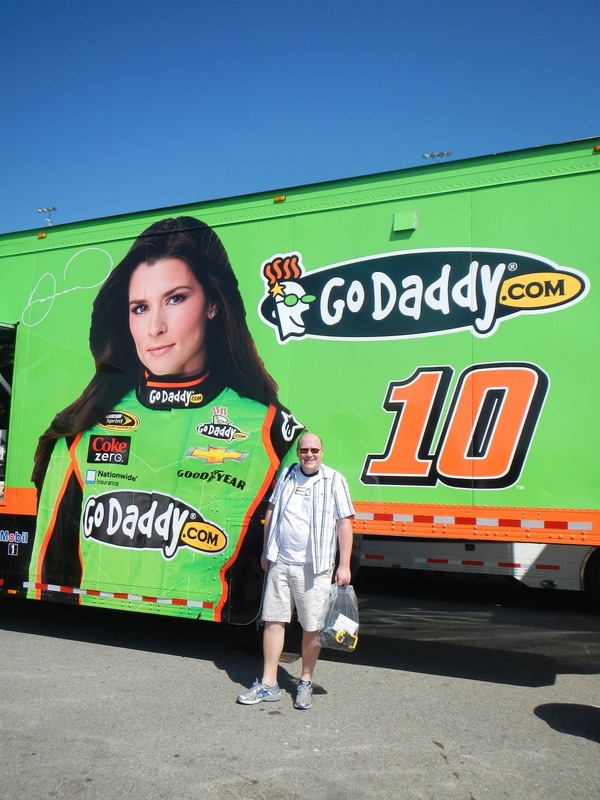 Dan took a lot of pictures of the GoDaddy car. 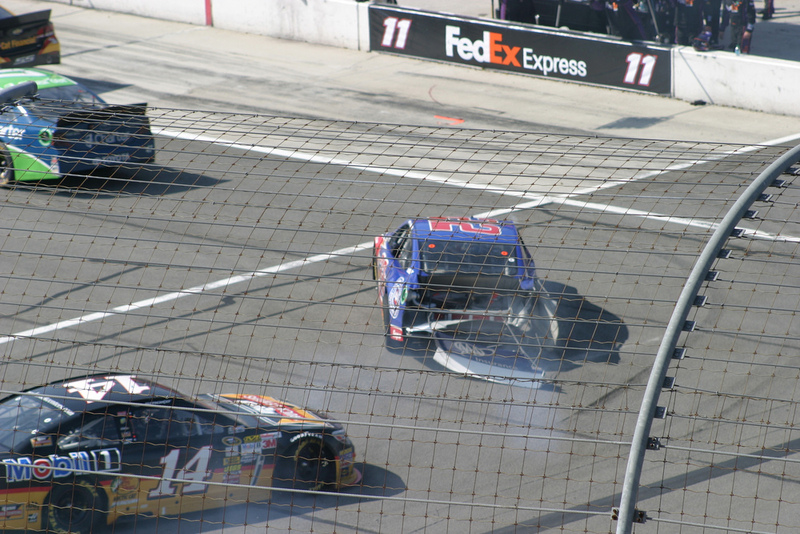 The race was mostly uneventful until the very end when Denny Hamlin and Joey Logano made contact in the last lap, causing Hamlin to take a hard crash into the wall. They two were vying for first, when the crash opened up an opportunity for Kyle Busch to take the lead and ultimately win the race. Hamlin and Logano has a contentious relationship prior to the race and took the feud to the track. Apparently, Logano also had beef with Tony Stewart. 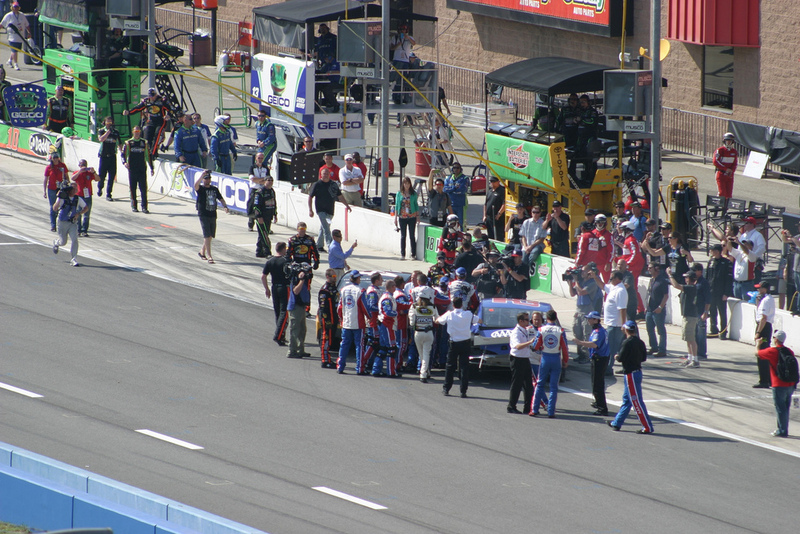 After the race, Logano got into a fist fight with Stewart on pit row. Stewart felt that Logano had blocked him during the final restart. NASCAR is better than ice hockey! Smashed up at the end of the race. 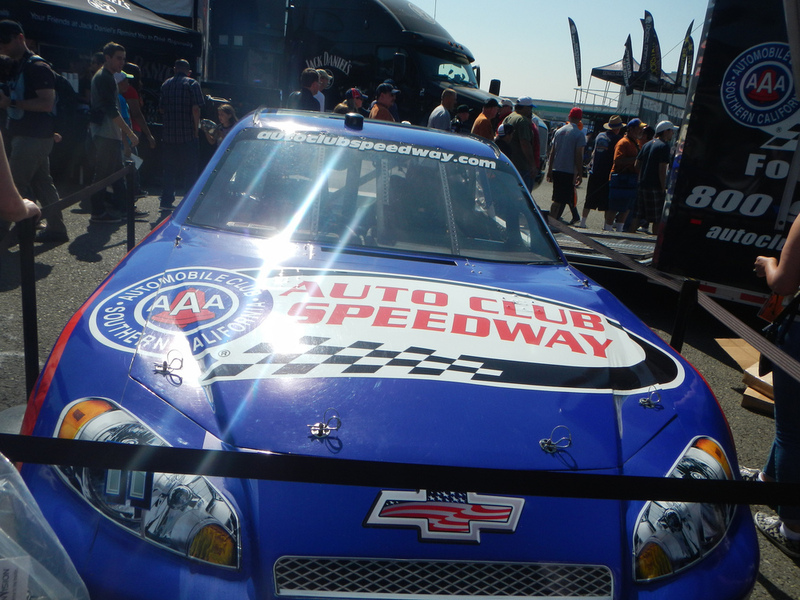 Our first NASCAR race was a ton of fun. We went home sunburn, covered in dirt and elated. Hopefully later this season or next year, we will be able to travel to different state for another race.